When you are first bringing your property to market or when you have a you need to set a price for your rental. There are several factors to consider that can help you set the right price for your unit. The right price will attract prospective tenants to your property and will generate some income for you as well. Look at properties in the same town as yours, but more specifically, in the same section of town as your rental. Prices can vary considerably if one side of town is considered more desirable than another. You want to look at properties that are similar in size to yours. Rentals in single family homes will typically command higher prices than those in multifamily homes. are usually willing to pay more for rentals in new construction buildings. You can easily view properties for rent in your area on sites like Zillow, Trulia and Hotpads. Keep track of the apartments that get rented quickly, those that lower their prices and those that have been listed for weeks. You may even want to go check out some of the apartments in person and compare them to your unit. Ask the if there is a lot of interest in the property. Even if you are not planning on listing your rental with a Realtor, you can have several Realtors come view your property to get a price opinion. They may have a good idea of what is renting quickly in the area and how your rental stacks up to the competition. Do not set a standard price for all one bedrooms, or set a standard difference in price between one bedrooms and two bedrooms. Unless the units are exactly the same, this strategy will hurt you in the end. You should charge slightly different rents based on how desirable the unit is. View- Apartments with a garden view are more desirable than those with a view of the parking lot. Updates- Units with updated appliances, hardwood floors or other amenities are more desirable than those without. Square Footage- A 1,000 square foot one bedroom is more desirable than a 700 square foot one bedroom. Layout- Railroad style apartments are less desirable than other layouts. Floor Level- Higher floors are more desirable. The exception is a walk up, where after the third floor, you will have to start lowering the price because people will not want to go up and down the stairs. An extra closet, balcony or window makes a unit more desirable. In addition to this, landlords may be able to put, on average, zero to six percent of the rent in their pocket each month as a profit. Keep in mind that many property owners, especially those with large mortgages or construction loans, do not see an actual profit until they sell their property or until they have owned the property . Regardless, if the unit is not benefiting you in some way each month (paying down your mortgage, reaping tax benefits, putting money directly in your pocket), you have not set the right rent, or worse yet, you have over-invested in the property. Are Prospective Tenants Requesting Viewings? Have prospective tenants been calling to see your property? If not, the price of your rental may be to blame. 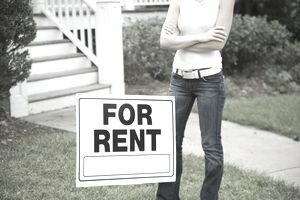 If your rent is set too high prospective tenants will stay away. If your apartment does not have the location or amenities to back up the higher price tag, prospective tenants will move on to another property. Setting a price for your rental is not a one time event. You must constantly and adjust the rent based on demand. For example, when the economy is bad, the demand for rentals can go up because people can no longer afford their homes and are forced to rent instead. A bad economy can also cause a greater demand for smaller, cheaper apartments because people have to downsize. Another example is, in the summer, the demand for larger apartments may be greater because families are trying to move before the school year starts. The basic rule of thumb is, when there is greater demand for your particular unit, you can charge a higher rent. When there is less demand, you may have to lower the rent to attract tenants. Jacara Small Business is part of the Dotdash publishing family.